Happy Monday. I hope you all had a wonderful weekend. My hubby was kind enough to take me to Home Depot to purchase the last of the faux wood blinds for Lemon Lane Cottage. His only stipulation was that they be hung the same day. I have a tendency to buy them and then let them sit for days weeks on end. Hanging blinds is my absolute least favorite job. I know I could wait for him to do it but we don't work well together on projects and my supervising self can't seem to stay under wraps. So I usually will get a project started until I am physically not strong enough to finish and then call in the troops to finish up. But there up, now I can mark a big check off in that to do box. What does all that have to do with penny candy? Nothing, at all. I just wanted a little recognition for finishing that dreaded task and I didn't really receive it here at home (whine, whine). 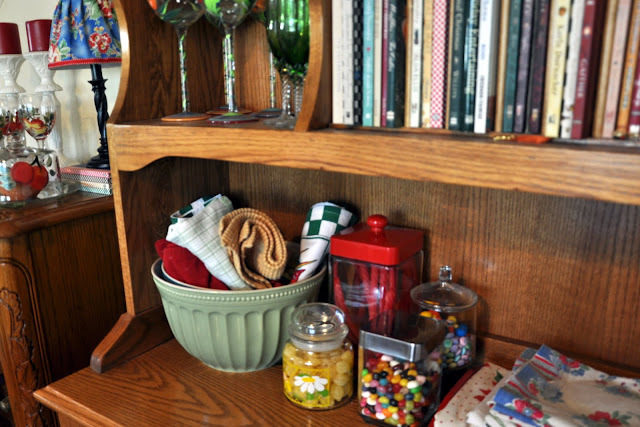 In between the blinds I did manage to arrange some mismatched candy jars into penny candy central. Doesn't it all look yummy. Both my husband and I remember going to our grandparent's homes and having them pull out hard candies for our visits. I would have loved it all displayed like an old fashioned penny candy store just like this. We have a really neat candy store in our downtown village and I can see a visit in the near future for gummy bears and pixie stix. Hope this week holds many sweet things for you. Hi Patty, you can hang blinds?!! I am so impressed. Wow. The candy jars are wonderful...so colorful and festive. Just so festive. Nothing better than yummy candy in cute little jars. It's colorful and very welcoming. I love all the color and they look so cute all displayed. I know of the store you mentioned. It is too charming isn't it? I love their holiday items. My MIL always buys chocolate turkeys for the T-giving table from there. Glad my husband hangs everything around here. I am not so good at that kind of thing. Cute candy display. I love the candy display in jars. It does remind me of the old general stores I use to visit as a kid. I don't dare have any in my home-they would always be empty. By ME! A BIG pat on the back for the hanging of the blinds. I honestly had some sitting for months, until my son and his family were coming to visit and I "had" to get them up! So an x-tra pat on the back for hanging them right away! You've got me wanting penny candy! And it really use to be a penny. I had a hankering today for Oreos. Hadn't had them in ages. So at the grocery store during my weekly shopping, I got some. You wouldn't believe how many varieties of Oreos they have. Hard to pick! Why is it that penny candies are so charming? Two stores come to mind when I think of penny candy. 1. The old fashioned Mercantile in Ferndale (northern CA coast). What a lovely store to explore. 2. A childrens shop here in Redding with old fashioned toys along with new baby items. 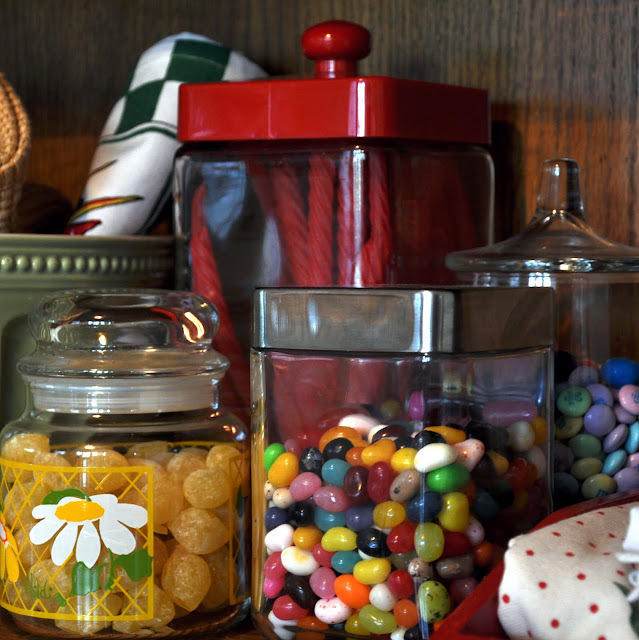 Behind the counter are jars and jars of colorful old fashioned candies and fresh made chocolates. At Christmas time they hand out samples of sugar plums. 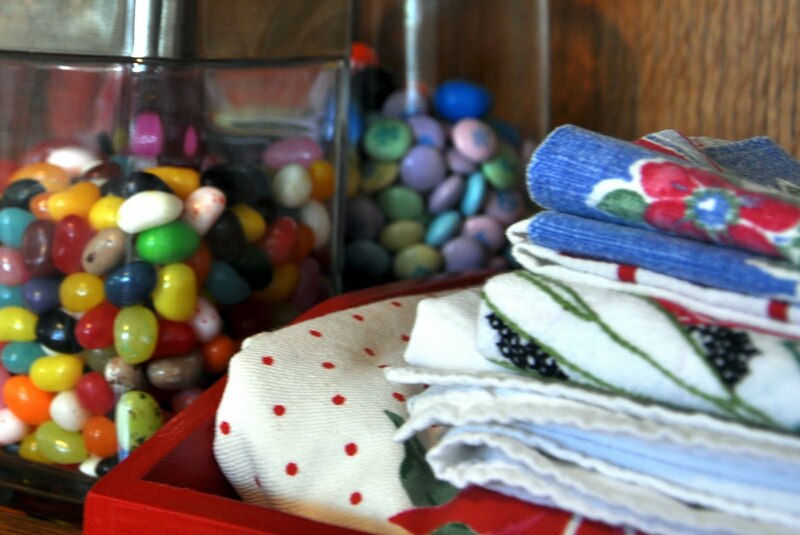 I so enjoy your blog!I remember when candy was a penny :) I have a jar of lemon drops for summer treats. Love all your dishes. I used to display penny candy in jars like this years ago, now I'm inspired to dig them out and head for the candy store! I love your blog. I've just stumbled across your gorgeous blog, and am so happy I did! 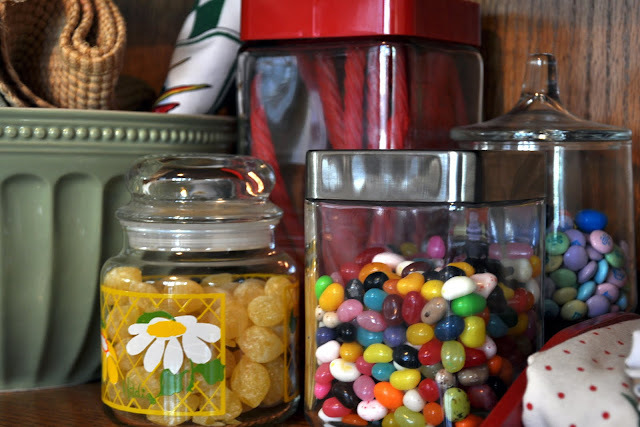 I love the candy in the jars - it never lasts long enough in our house to warrant a jar, unfortunately! Your candy displayed in the jars does look sweet (pardon the pun). I think if I had jars of candy, the jars wouldn't stay full for too long. Love your blog! Well I'll give you credit for hanging blinds....yikes, I wouldn't know where to start. Love the candy jars and gummy bears are my favorite....better hurry to the candy store and get some! Thanks for following my blog. It's nice to meet you. I'm following you too and will be back often.